We have some fun stuff happening around the Shop starting this week! But first! I'm such a tail wagging, happy puppy dog! It finally snowed! I've been having fun running through the snow and eating the snow (white snow only). I love playing chase in the snow. I get running, slid to a stop, spin around and run back from where I started. Leaping through, digging and burying stuff in the snow is so much fun. The best part is coming inside and jumping up on Mom's lap to get warm and dry. Mom doesn't seem to think so, though. She always pushes me off and tells me to go lay on my dog bed until I dry off. Enough about me and snow. Let's get to what's happening around the Shop! 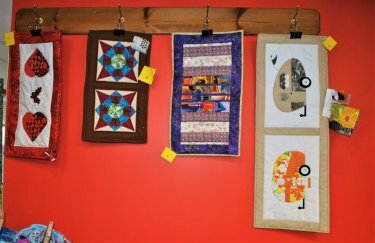 First, our Fabric Challenge table runners are on display and waiting for you to come in and vote for your favorite one. The photo doesn't do them justice. You have to see them in person to really appreciate them. Stop in, check them out and vote for a table runner. All 4 of these table runners plus the ones from the last Fabric Challenge will be donated to area nursing homes. We would like to thank our Challengers for participating in our Fabric Challenge. Voting will be until closing on Saturday, February 18th. Second Excitement for the week. We are officially a Necchi Sewing Machine Dealer. Necchi is a Division of Janome Sewing Machines. 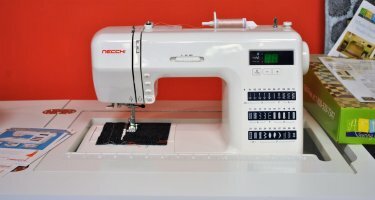 3 of our 4 Necchi Sewing Machines have arrived and are set up for you to try out. 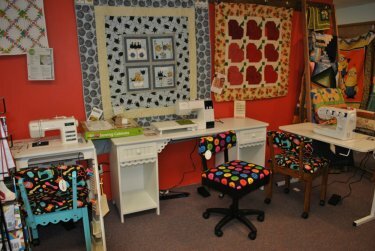 We do ask that one of our staff be present to go over the sewing machines while you try them out. 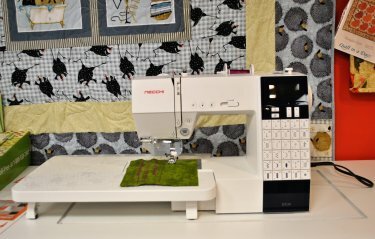 We have chosen the 4 sewing machines we thought our customers would be really interested in. There are more models available we can order. Mom will be going to Janome in a couple of months to go to their Sewing Machine Repair School. 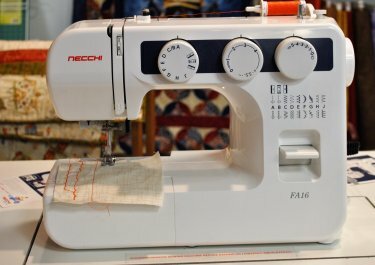 These are high quality sewing machines that will serve you for many years to come. 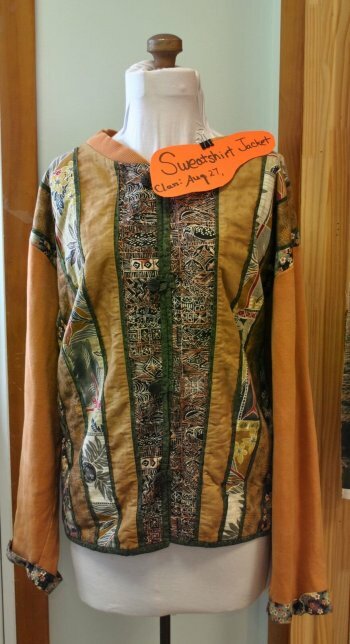 We have extended our 30% Off Minky and Fleece Sale to Saturday, February 18th. Now on to our Class Schedule. We have photos for most of the upcoming classes but not all of them. Saturday, February 25th: Double Irish Chain We are not going to cut hundreds of little squares. 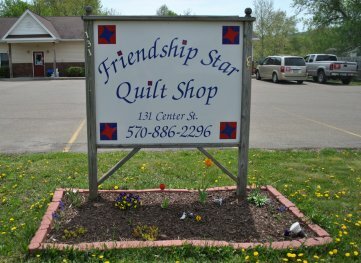 March 18th: Learn to make Chenille with AJ Hudock What can you make with Chenille? 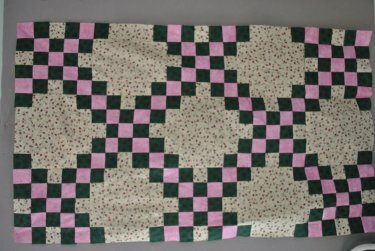 Everything from pot holders to quilt blocks. on your piecing. 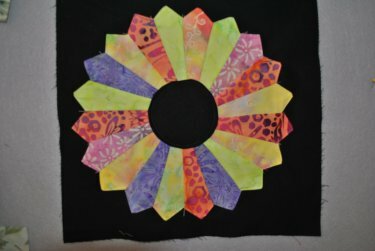 Learn to make intricate designs with little effort. Well, I think that covers everything. Now, it's time for me to head for home and go play in the snow with my dog sisters. Then curl up for a nap with my cat after dinner.